Are you still trying to figure out what to do with all of that leftover turkey from Thanksgiving? 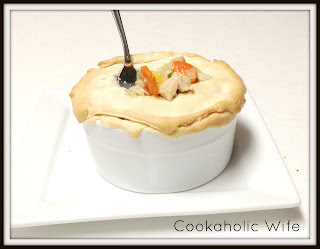 For once I decided to plan ahead for the leftovers and decided to make a pot pie with the turkey. My aunt made at 15 lb. bird and with only 7 of us there on Thanksgiving, there was more than enough leftover turkey to go around. Not only does this use up your leftover turkey, but also any gravy and celery you may have left. 1. Melt the butter in a large skillet over medium heat. Add the celery, carrot, potato and onion and cook for 7-10 minutes or until the vegetables are soft. 2. Meanwhile preheat the oven to 400 and line a baking sheet with foil. 3. Add the turkey, parsley, stock, gravy, corn, peas, salt and pepper to the skillet. Stir to combine and cook for 5 minutes or until the mixture has thickened up. 4. 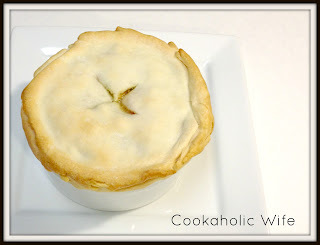 Place the prepared pie crust into three large ramekins, saving the extra crust for a topping that will cover the edges. 5. Scoop the turkey and vegetable mixture into the prepared ramekins and top with the remaining crust. Crimp the edges to seal. Cut an “x” shaped slit in the top of the crust to let the steam escape. 6. Bake for 25 minutes or until the pie crust is a light golden brown. Let cool for 10 minutes before serving. I really need to ask for smaller ramekins for Christmas. This was so incredibly filling. I maybe ate half of my ramekin full which is probably about 1 1/2 cups. Honestly, I think this was almost better than Thanksgiving dinner. Its warm, hearty, filling and super tasty. Tom also commented that the turkey doesn’t have that “leftover turkey taste”. I have no idea what that means, but if you do, at least you know ahead of time this won’t taste that way.